This is my christmas wishlist for this year, I am feeling so festive at the moment and seeing all the christmas lights gets me so excited! I can't wait for the dinners, presents and lots of drink (of course). 002: These boots are plain gorgeous, they are biker girl and stud galore in one! I was going to purchase these but didn't want to pay £80, now they are down to £60 (which I STILL can't afford) so a christmas present maybe. You can get them from Office. 003: This WILL be my christmas party dress, I absolutely love it and would feel amazing in it. A nice clutch bag would go well with this and some plain heels. It would shine in the light and make everyone look! I have never loved a dress so much, having over 30 dresses in my wardrobe you'd think I would calm down on my dress obsession but a girl can never have too many... right?! It's priced at £58 from motelrocks. 004: A wonderful winter bag, the colour is lovely and you can carry it or use the shoulder strap. I have quite a lot of bags and I change which one I use very often but who doesn't love bags. I'm not a fan of jazzy bags I prefer plain and simple! You can get this from Topshop for £48. 005: All my friends and family know how much i loooove kitty cats, anything with them on i'll have!! So a jumper is no exception, winter is here so I can have this gorgeous cat jumper to keep me snug as I don't have my cats with me anymore :( I'd wear it with a skirt or jeans and the boots in my wishlist. You can get it from Romwe for £26 bargain! 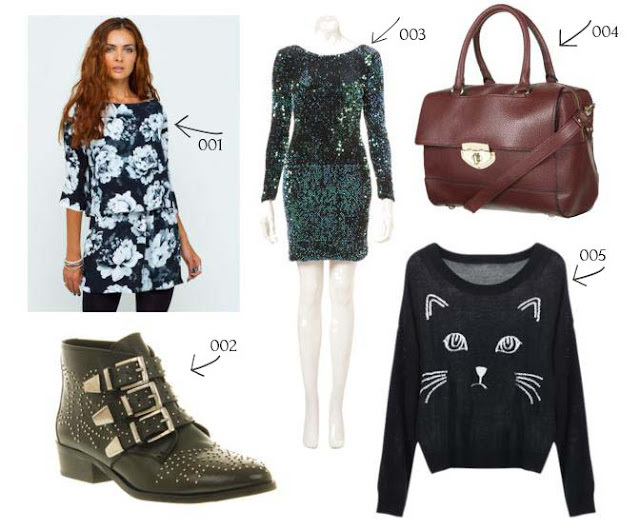 Great list, that cat jumper is so cute!